The Executive Summary of City of Ottawa ACS2018-CSD-FIN-0003 Long Range Financial Plan Transit Update (PDF) contains an interesting change. Transit Taxes – increase in the assessment growth factor from 1.3% to 1.5%, to reflect recent trends, and increasing the transit tax to 3% from 2.5% to align the increase to the same rate as operating costs and capital costs. 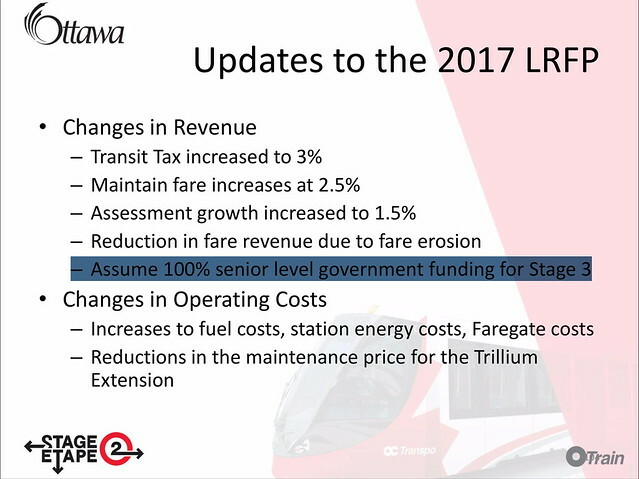 Transit Fares – increase of 2.5% aligned with the increase in operating costs, consistent with the CUTA definition. Fare revenue projections were also decreased to reflect recent trends and the decrease in the average fare. Grants from Senior Levels of Government – the revenue from senior levels of government is projected at two-thirds funding for future [Bus Rapid Transit]. For future [Light Rail Transit] this assumption was changed from two-thirds funding to 100 per cent funding. above from slide 104 of Stage 2 Light Rail Transit Project: Technical Briefing – February 22, 2019 (PDF). Highlighting of line in blue mine. The previous 1/3 federal, 1/3 provincial, 1/3 municipal funding model was manifestly unfair considering that municipalities collect 8 cents out of every tax dollar. But it seems a bit unrealistic to me to expect provincial and federal governments to suddenly fund all of rail transit, particularly if those governments are right-leaning. DISCLAIMER: I am definitely not an expert in the long term financial plan or in Canadian transit funding. How to Train Your Dragon 1 is a wonder. Hiccup as an outsider, an inventor, compassionate. Astrid as a strong independent woman. Toothless as a sort-of cat with a lot of personality. It has lots of humour and loads of heart. Even the music is great. How to Train Your Dragon 2 is good. It still has most of the elements that make the first movie work. Sequels are always hard. I do think Stoic’s end should have been more heroic, but that’s really my only complaint. Challenging Hiccup’s optimism and pacifism makes for an interesting change from the first movie. How to Train Your Dragon 3 is… not good. The 91% on RT gave me a lot of optimism, but I definitely wouldn’t rate it anywhere near that. 50% maybe. The humour is off and the story is just another dragon-hating-enemy variant. Gobber is underused, the secondary dragonrider characters are way overused. The only good part is the ending. Plus which, I have to say, the new star character, the Lightfury, is just… not good. It doesn’t even look good. The entire movie is full of beautifully rendered details down to glints off of dragonscale armour, but the Lightfury looks like it is made out of styrofoam. Sparkly styrofoam. And has the personality to match. They should call her Blankness. Instead of a strong female character the Lightfury is basically all damsel in distress. It kind of coos incomprehensibly and has to be rescued from danger. Every time I looked at it I was pulled out of the movie, into wondering why with all that computing power and animation expertise they made a partner for Toothless that has no detail or personality. Just a sparkly white blue-eyed blandness. I will watch the first movie many times, the second occasionally, but for the third I will skip the entire movie except the ending. The City of Ottawa has a Safer Roads Ottawa program including a Road Safety Action Plan (2012-Beyond). The City’s Safety Improvement Program (SIP) touches on all three Es of road safety: education, enforcement and engineering, with primary focus on engineering. The program selects locations to study, carries out in-depth studies of collision patterns and recommends countermeasures. Typically, the program studies locations with higher-than-average traffic collision rates. There is however a big difference between saying the right things and actually budgeting and carrying through. That doesn’t look to me like primary focus on engineering. The city is updating the Road Safety Action Plan, there is an online survey running until Tuesday, March 19, 2019, 11:00 pm. The survey is in my opinion super confusing. You’re supposed to select road safety priorities, but it mixes causes of road safety problems with vulnerable users, e.g. Aggressive Driving is listed along with Pedestrians. If I rate Aggressive Driving 5 – Highest priority and I rate Pedestrians 5 – Highest Priority, does that mean Pedestrians pose as great a road safety risk as Aggressive Driving? By giving that priority am I saying Pedestrians cause road safety issues? There is space for comments. You might just want to email them at rsap-pasr@ottawa.ca though if you want to be able to be completely clear about what you mean. There is a general frustration I have with these kinds of consultations which is that we already have best practices. How many times do we have to provide the same input: follow international best practices, redesign the roads, slow the cars, increase the budget. There are already the right words in the 2013 Transportation Master Plan, there are for that matter already the right words on the Safer Roads Ottawa web page itself: primary focus on engineering (i.e. redesign the roads). Establish consistent design standards to ensure cycle and pedestrian-friendliness is designed-in from the outset into all highway and traffic schemes, new developments and planned highway maintenance work. 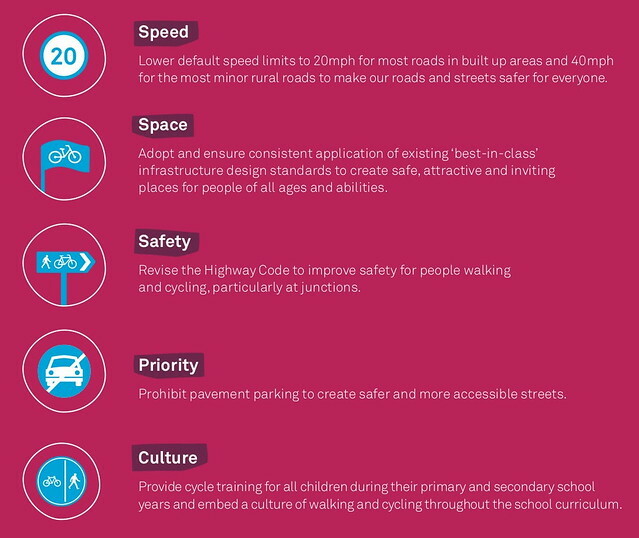 Make 20mph [30km/h] the default speed limit for most streets in built-up areas, with 30mph [approx. 50km/h] (or higher) limits being the exception that requires signing, not the other way round. Rebalance overall transport spending, making a far greater proportion available for cycling, walking and safer streets, including local road and path maintenance. And you don’t have to speculate about Vision Zero, there’s a whole Vision Zero Academy from Trafikverket, the Swedish Transport Administration. Anyway, I encourage you to respond to the consultation by the March 19, 2019 deadline. The branch lines in the UK in the 19th century brought some major changes. One was a spring rush of early flowers and strawberries flowing from the countryside into the cities. Most of the branch lines were closed in the 1960s following Dr. Beeching’s report. There are also books e.g. I should probably mention as a sidebar that I just stream podcasts, I don’t actually download them, as I am always on wifi or LTE. When in Rome – https://soundcloud.com/wheninromepodcast – Note that When in Rome is a crowdfunded podcast; you can find funding information on Kickstarter. I also tried the Caesar’s Gallic War podcast but I found the level of detail overwhelming. I listen to a lot of BBC Radio, but on the website now rather than as podcasts. I most consistently listen to In Our Time. I also like the walking show Ramblings, as well as Open Country. For science interviews I like The Life Scientific. There is also a yearly series of lectures, The Reith Lectures. I very much like BBC Radio London’s Robert Elms, in particular on Tuesdays when he has Maxwell Hutchinson about architecture and on Thursdays when he has Jason Solomons about movies. I like BBC Radio 3 Essential Classics, but only when Suzy Klein is the host. I also like Sunday Morning, with former Essential Classics host Sarah Walker. Les années lumière – Radio-Canada – sciences – It has the distinction of being the only Canadian radio I listen to, although I liked it better when Yanick Villedieu was the host. There used to be three interprovincial rail links. 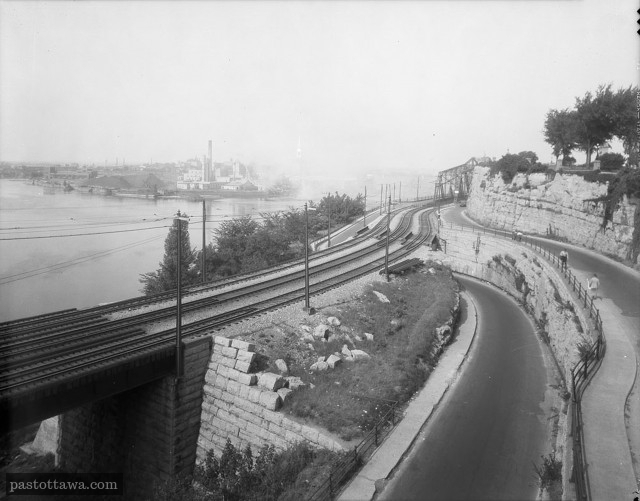 Ottawa streetcar Line H went across the Chaudière Bridge to Eddy Park. 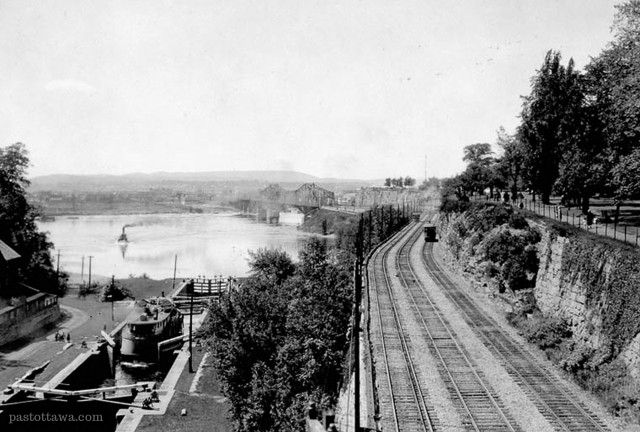 Hull Electric Railway streetcars went across the Alexandra Bridge to Ottawa Union Station. CN Rail CP Rail crossed at Alexandra Bridge & Prince of Wales Bridge. Line H (Hull – St. Patrick) crossed the Chaudière Bridge to Eddy Park (the solid red line on the map below). Three rail lines crossed the Alexandra Bridge. The outer two tracks were for the Hull Electric Railway streetcars (one line for each direction). The centre track was for heavy rail, I believe CN rail. The Internet tells me the heavy rail was CP Rail. 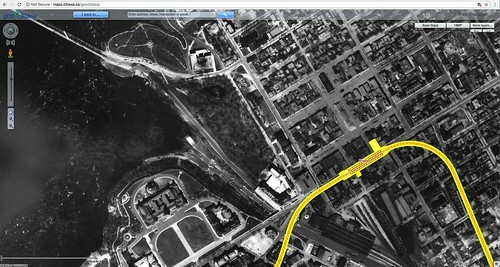 You can sort-of see the rail lines heading up to the Alexandra Bridge (diagonally to the upper left) in this 1928 aerial image below from GeoOttawa, on which just for illustration purposes I have overlaid Confederation Line 1 underground rail and Rideau Station in yellow and red. I was unable to find a map for the historical Gatineau streetcar (Hull Electric Railway) but there are photos available. Above is Hull Electric Railway (HER) car No. 50 in a clear view of HER cars both inbound and outbound on the tracks to and from Alexandra Bridge, from TrainWeb Hull Electric Company. 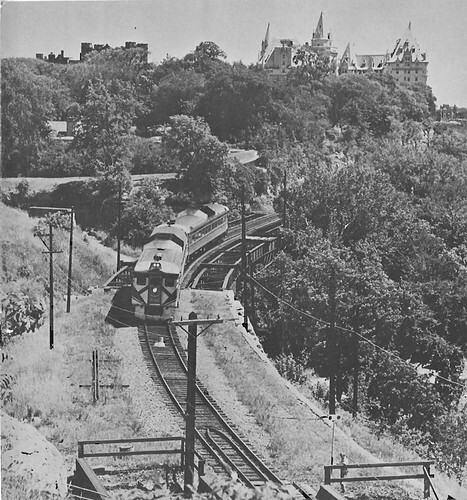 Above is a view looking south of a Hull Electric Railway car inbound to Ottawa, image CSTM/MAT04642 from Canada Science & Technology Museum Picturing the Past – A Train Journey through the Ottawa Valley Using the Mattingly Image Collection. The above postcard with colour applied almost certainly originating from this image below posted on Lost Ottawa February 19, 2013. The Hull Electric Railway closed in 1947. The terminal was underneath Confederation Square, across from Ottawa Union Station. 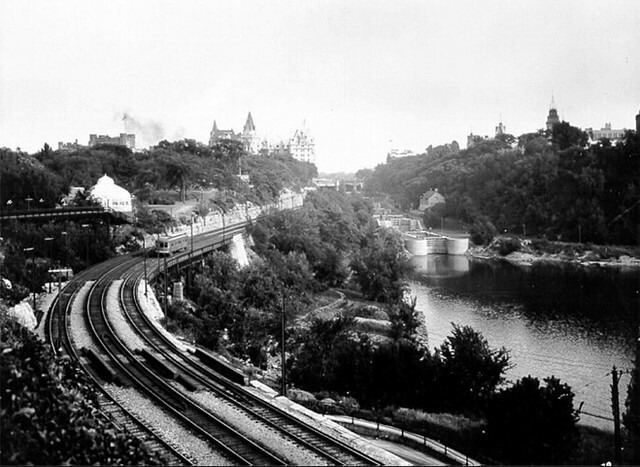 Heavy rail crossed the Alexandra Bridge to Gatineau on the centre track, and returned to Ottawa over the Prince of Wales Bridge. There were numerous stations on both sides of the river. Below is an image of heavy rail crossing the Alexandra Bridge, from Urbsite – Those Museum Trees, The Digester Tower, and a Smokestack. Even after the Hull Electric Railway lines were removed in 1947, the heavy rail continued until 1966 when Ottawa Union Station was closed. You can see just the central rail tracks remaining in this cover image from Canadian Rail (Number 179, July-August 1966 Ottawa Union Station Closes). 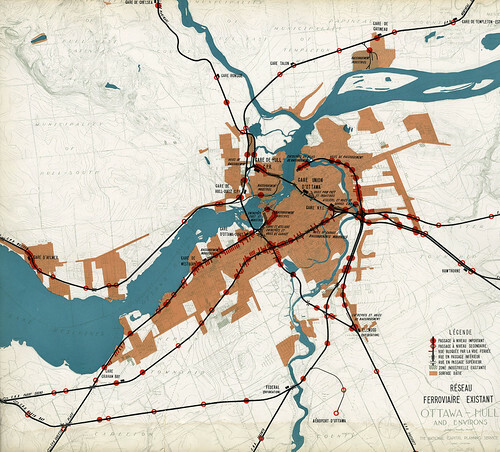 The Greber Plan Plate 12 Réseau Ferroviaire Existant Ottawa – Hull and Environs 1948 below gives a view of industrial Ottawa, with a mix of passenger and freight rail lines criss-crossing the capital region. 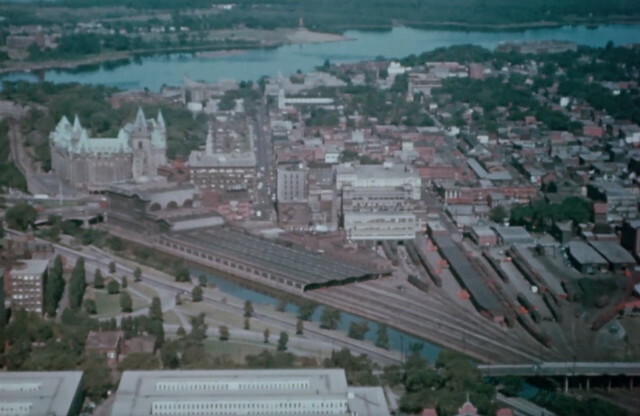 You can see the loop of a train going Ottawa – Alexandra Bridge – Hull – Prince of Wales Bridge – Bayview Station in the video A train ride from Union Station Ottawa to Bayview via Hull 1966. You can also see some photos of the various stations in Canada Science & Technology Museum Picturing the Past – A Train Journey through the Ottawa Valley Using the Mattingly Image Collection. Above was from draft Plan for Canada’s Capital 2017-2067 (PDF), page 103 “Capital Arrivals, Scenic Entries and Parkways” which in usual NCC fashion has disappeared from the web. Since everything that goes around comes around, having eliminated all of the interprovincial rail, the NCC circa 2009-2013 tried to conjure up some ideas about bringing it back, as a light rail loop. In fact the only thing remaining on the web is the summary hosted by Quebec’s STO – Connecting Communities: An Interprovincial Transit Strategy (PDF). Some other sites have preserved the report: Action Sandy Hill has the full report in a Google Doc, and City Centre Coalition has all of the annexes/detailed reports as Google Docs. 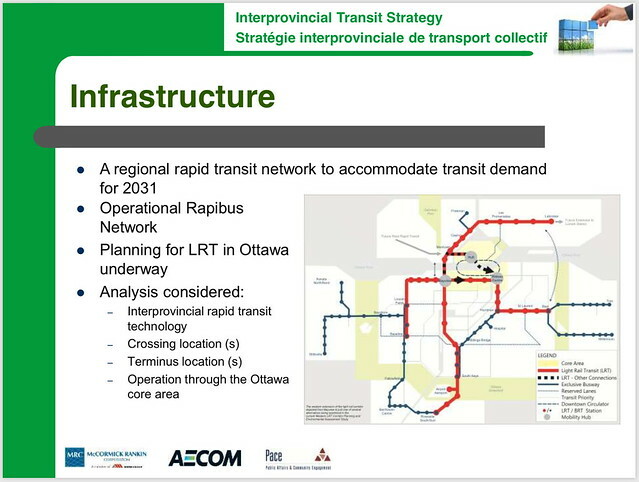 I saved the presentation deck, and here is the key slide with their imaginary LRT loop. There was no money and no plan so the whole thing is moot. It would be great if OC Transpo and STO would at least integrate at the level of payment, but right now all you can do with your OC Transpo Presto card is take STO if you have an OC Transpo transfer or monthly pass. The only thing likely to happen in terms of interprovincial rail is a resurrection of the Prince of Wales rail link, since all of the infrastructure is still there. This might happen in Ottawa LRT Stage 3 (which has a reasonable chance of being funded) or, rather less likely and also somehow including an Alexandra rail crossing, in the proposed but not funded Gatineau West-End Rail. On June 20, 2018 there was a news release from the Gatineau Mayor’s Office, in French only – Gatineau dévoile son projet préliminaire de système sur rails pour l’ouest. The press conference video for the announcement is also available. Note this only a proposed system, it is not funded. The map and legend aren’t translated. SLR = système(s) de train léger sur rail or in English LRT = Light Rail Transit. 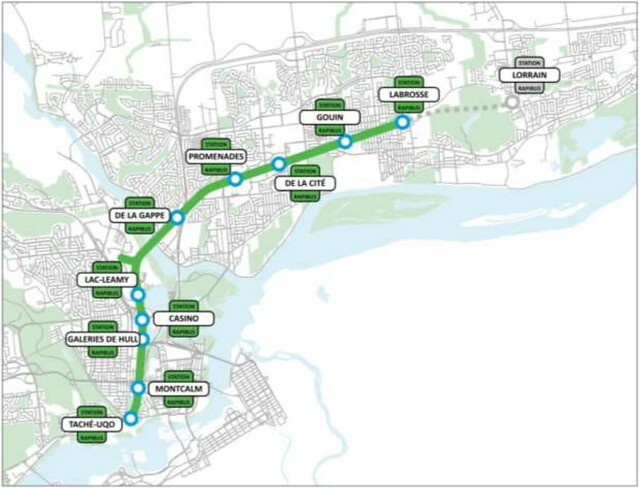 The above map is from page 17 of presentation Rail system project for West Gatineau – June 2018 (PDF). 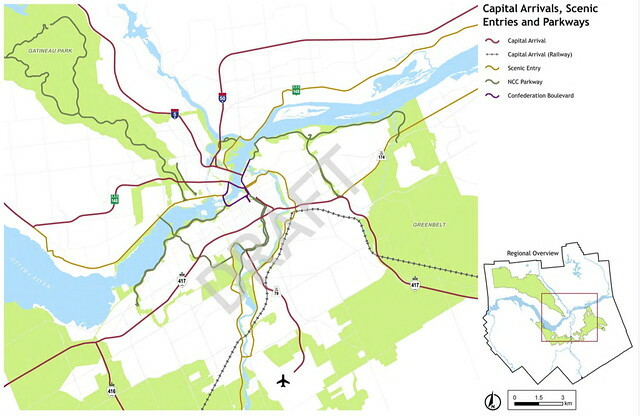 The deck is also available in French: Présentation du projet de système sur rails dans l’ouest de Gatineau – Juin 2018 (PDF), and I have put a copy of the French map on Flickr: Gatineau – carte du tracé proposé pour le système sur rails. You can see that the (currently disused) Prince of Wales bridge (pont Prince de Galles) is the key connection point, as it would connect both to the proposed west-end rail system and to the existing STO Rapibus (Bus Rapid Transit system) shown in green in the map above and below. Above map from Figure 1 page 8 of Le RAPIBUS : Vecteur de changement, Bilan 2013-2018 (PDF). STO Rapibus Station Taché-UQO at 100 Boulevard Alexandre-Taché is right next to the (disused) rail line that crosses the Prince of Wales bridge from Ottawa. 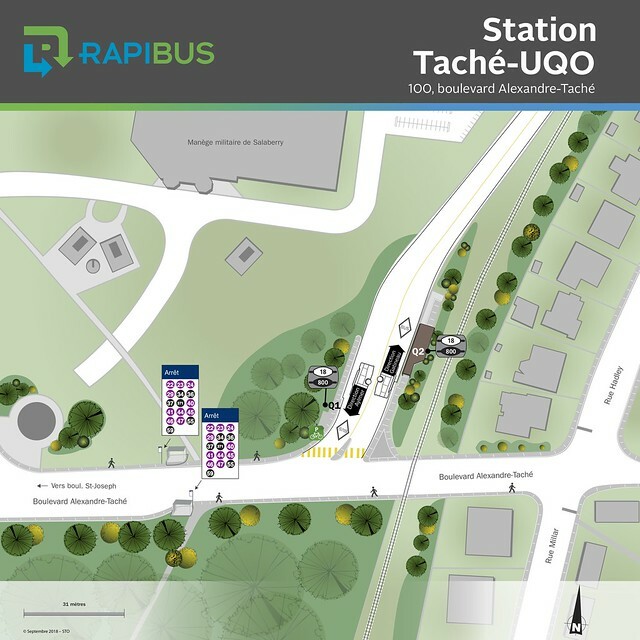 Above from STO – Rapibus Stations, Taché-UQO station – station plan (PDF). 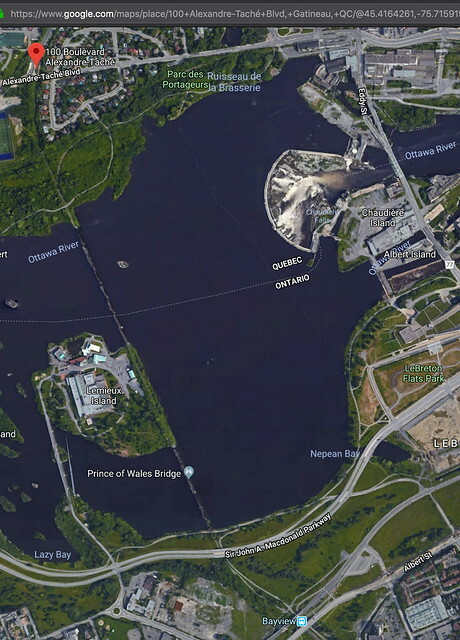 So the proposed scenario has Gatineau’s rail line crossing the Prince of Wales bridge to Ottawa’s OC Transpo Bayview Station, where OC Transpo east-west Line 1 and north-south Line 2 already intersect. 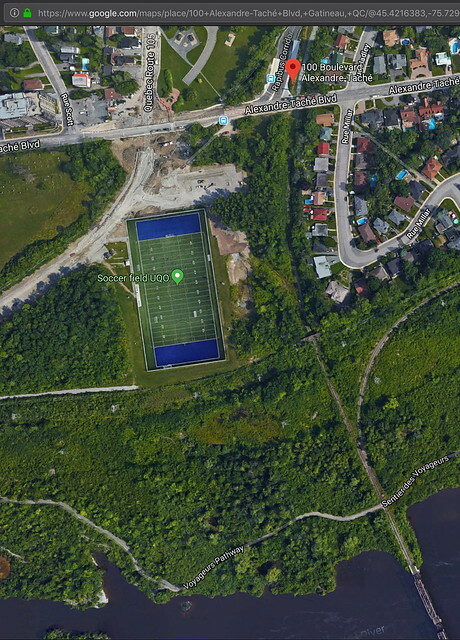 Here is a Google Maps view where you can see the rail line running through the Gatineau riverfront parkland past Station Taché-UQO. And here’s a wider view of the line running from Bayview Station across the Prince of Wales bridge to Station Taché-UQO. There is an interesting transit planning question as STO Rapibus already parallels the disused rail line for most of its length, prompting one to wonder whether they shouldn’t just convert to rail transit along most of the Rapibus corridor once trains cross the river again. 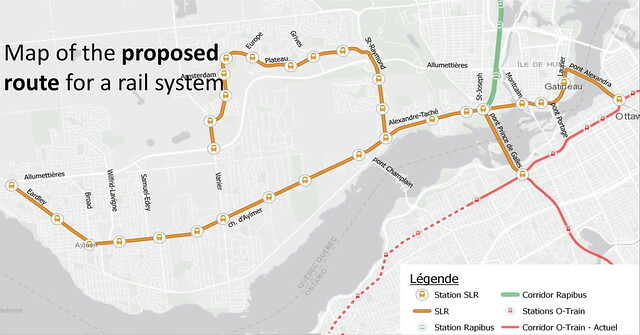 The proposed route also has the Gatineau LRT connecting across Alexandra Bridge to Rideau Station. This is quite a surprising proposal, as the entire area is currently designed for car traffic, with a pedestrian and cyclist side pathway on the Alexandra Bridge. It is true that historically both heavy rail and streetcars ran across the Alexandra Bridge, but that infrastructure was all torn up decades ago. It is kind of unfortunate that both at Prince of Wales and Alexandra Bridge we’re ending up trying to recreate rail systems that used to exist, although at least for Prince of Wales the infrastructure is just disused, not totally removed. Above from Greber Plan: Plate 12 Réseau Ferroviaire Existant Ottawa – Hull and Environs 1948. 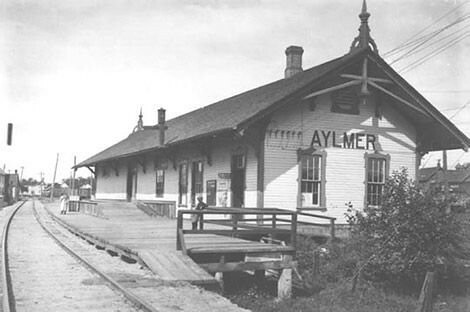 Think how much easier it would be to get around Ottawa-Hull if the rail network and Gare d’Aylmer, Gare de Hull-Ouest, Gare de Hull, Gare Ironside, Gare de Chelsea, Gare Talon, Gare de Gatineau, Ottawa Union Station, Ottawa West Station, Westboro Station and Graham Bay Station still existed. On the plus side, at least we’re starting to restore the ability to get around with modern commuter rail infrastructure. These are very early days, so rely on the City of Gatineau for official word on the specific rail line routes and stations for west-end rail.